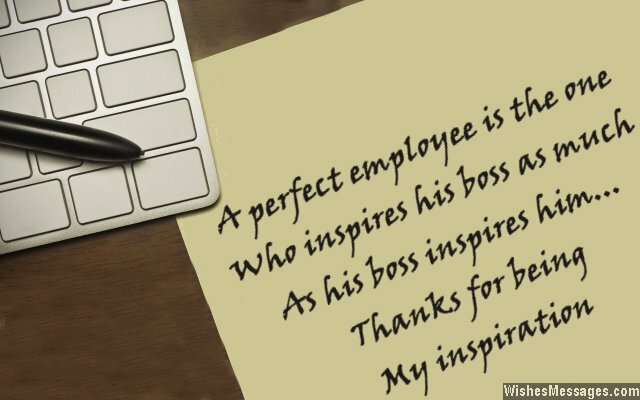 Thank you messages for employees: A note of appreciation from business owners and company bosses go a long way in inspiring employees. Just a few words are enough to boost employee morale and overall productivity. If one of your subordinates deserves appreciation for being an outstanding professional, take ideas from this post to write a note of gratitude. Hard working and loyal employees take pride in knowing that their bosses admire their work. It motivates and inspires them to continue doing what they do best – being good employees. 1) A perfect employee is the one who inspires his boss as much as his boss inspires him. Thanks for being my inspiration. 2) Thank you for bringing your positive attitude to work every day. Projects become easier to execute, changes become easier to implement and problems become easier to solve. 3) My words can never be enough to praise your actions because your work always meets my expectations. Thank you. 4) Thank you for showing all your colleagues that the pursuit of excellence is the best way to climb up the organizational ladder in this company. 5) Your enthusiasm is a personality trait that cannot be learnt and a skill which cannot be taught. Thank you for being the life of the workplace. 6) The world of business survives less on leadership skills and more on the commitment and dedication of passionate employees like you. Thank you for your hard work. 7) Successful companies are run by successful entrepreneurs who hire successful employees. Thank you for being a key part of this chain. 8) Employees like you are the epitome of professionalism. Thank you for bringing your best to work every single day. 9) Interns admire you, your colleagues respect you and your boss trusts you – thank you for being a great role model for everyone around you. 10) Your contribution to the company’s growth may be measured in targets and KPIs but your contribution on the office floor is measured in the positive feedback I receive from your colleagues. Thank you and congratulations for winning the appreciation of your teammates. 11) You deserve a RAISE because the number of sales you make RAISES the morale of your colleagues. Thank you. 12) It takes a college degree to get a nice job but it takes a lot of hard work to get appreciation from your employer. Thank you for working hard. 13) You are so irreplaceable to this company that it makes me wonder whether you are my greatest strength or greatest weakness. Thanks. 14) The walls of our office would be weakened without your presence. Thank you for standing strong. 15) I hold you in HIGH regard because you have created HIGH benchmarks for other employees with your HIGH quality work. Thank you. 16) You are the employee that every intern dreams of becoming, every colleague thinks of having and every boss wishes he had. Thank you. 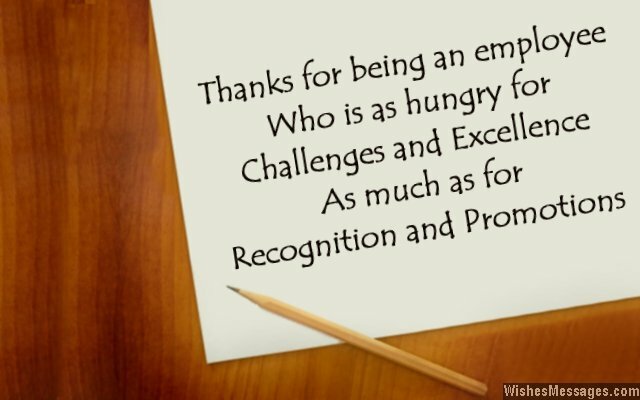 17) Thanks for being an employee who is as hungry for challenges and excellence as much as for recognition and promotions. 18) All bosses would be cool and calm if they had efficient employees like you. Thank you. 19) Your biggest achievement in this company has not just been winning all the contracts, but also winning your boss’s trust. Thank you and well done. 20) Thanks for being that employee who assumes leadership when the boss is not around and ensures compliance when he is. 21) Thank you for being so committed. It’s only a matter of time that all your efforts will be duly remitted. 22) You are our company’s perfect catch and an ideal employee whose performance no one else can match. Thank you. 23) From friendship to mentorship to leadership, you have given this company a warm kinship in every possible form. Thanks. 24) Thank you for realizing that by taking ownership of every project, you have taken ownership of your own success. 25) Awards like Employee of the Month are of no value for employees like you perform well every single day of the year. Thank you. 26) Your professionalism embodies the company philosophy and your hard work is a prime example of how employees can further their careers in our organization. Thank you. 27) Giving you this thank you note is an instruction that my heart has asked me to follow, not the HR department. Thanks. 28) Employees like you make becoming a boss so much easier. Thanks. 29) Your excellence and brilliance have always made for a stunning performance at work. Thanks for bringing so much permanence to our company. 30) If your perseverance and integrity were contagious diseases, everyone at work would be as perfect as you. Thanks for doing a good job. 31) Thanks for shouldering responsibility and putting the company’s interests ahead of your own. 32) Thanks for treating the company’s problems as your own. You have what it takes to be a terrific employee and a future leader. 33) I am thankful for having employees like you who never shirk responsibility even if it means taking blame when mistakes are made. Thank you. 34) Thanks for being an asset to the company, a trusty subordinate to your boss and a source of inspiration for your colleagues. 35) Thanks for backing up the credentials in your resume with hard work, perseverance and loyalty to the company.